Upon growth factor stimulation, the MAP kinase pathway is activated and ultimately converges onto chromatin resulting in the phosphorylatin of H3 at two specific serine resides (S10 and S28). These phosphorylation events are very rapid and transient, and correlate with the transcriptional activation of genes such as c-fos and c-jun (Figure 1). 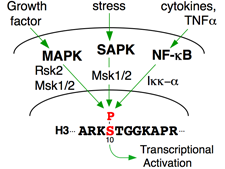 The mechanism of transcriptional activation by phosphorylated S10 and/or S28 remains unclear. Currently, we are testing the significance of phosphorylation at these two sites and how they interact with the transcriptional machinary to regulate immediate-early gene expression. Our previous work (Cheung et al., 2000) showed that H3 phosphorylation promotes acetylation on the same histone and that these modifications function together to activate gene expression (Figure 2). 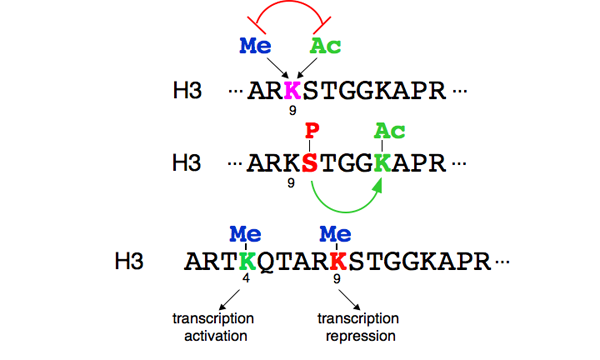 This idea that histone modifications can work in combinations was formally described as the Histone Code Hypothesis (Strahl and Allis, 2000). In addition, we are also developing new techniques and assays to dissect the intricate interplay between histone modifications in vivo.